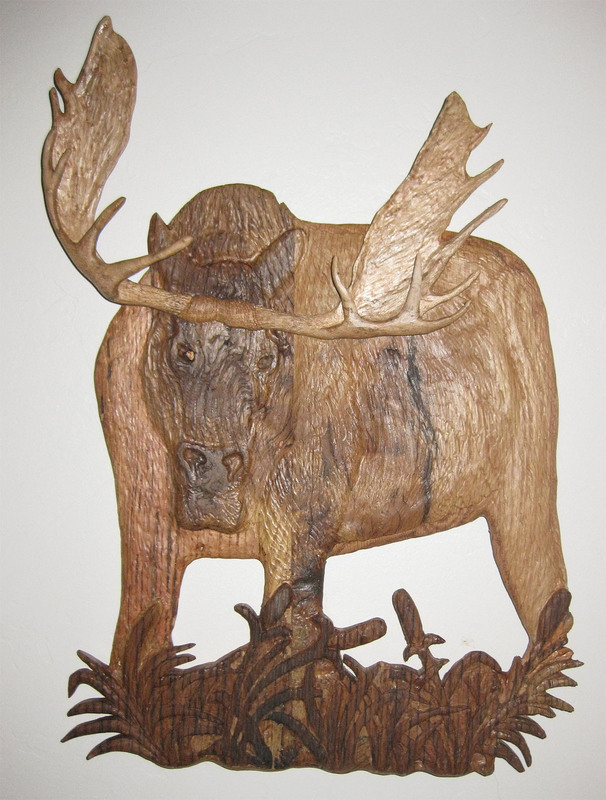 In November of 2014 I began sculpting layered hardwoods of famous Jackson Hole venues. 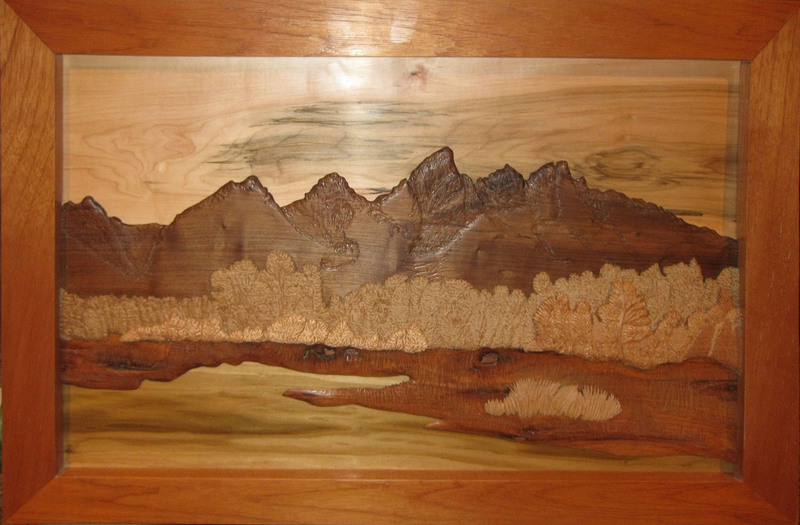 Grand Teton Mountain Range was my very first layered hardwood relief sculpture. 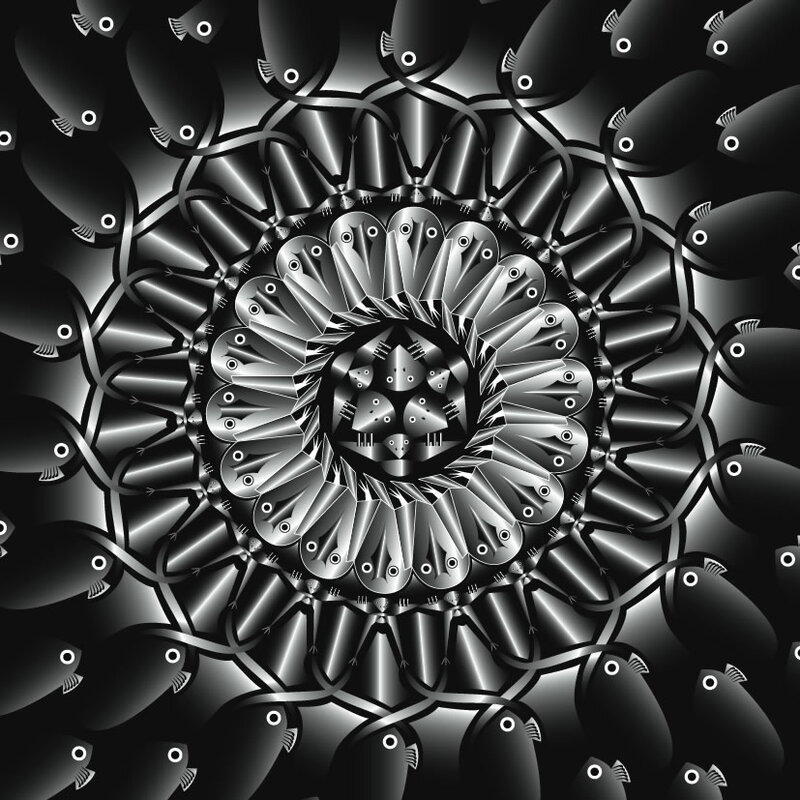 I truly learned this art by working at this for three months. I redid the trees a few times over before I got it right. Since then, I entered my fourth carving (Moulton Barn), see below, into the Jackson Hole Salon Show of 2015 and took third place in the ‘People’s Choice’ awards. 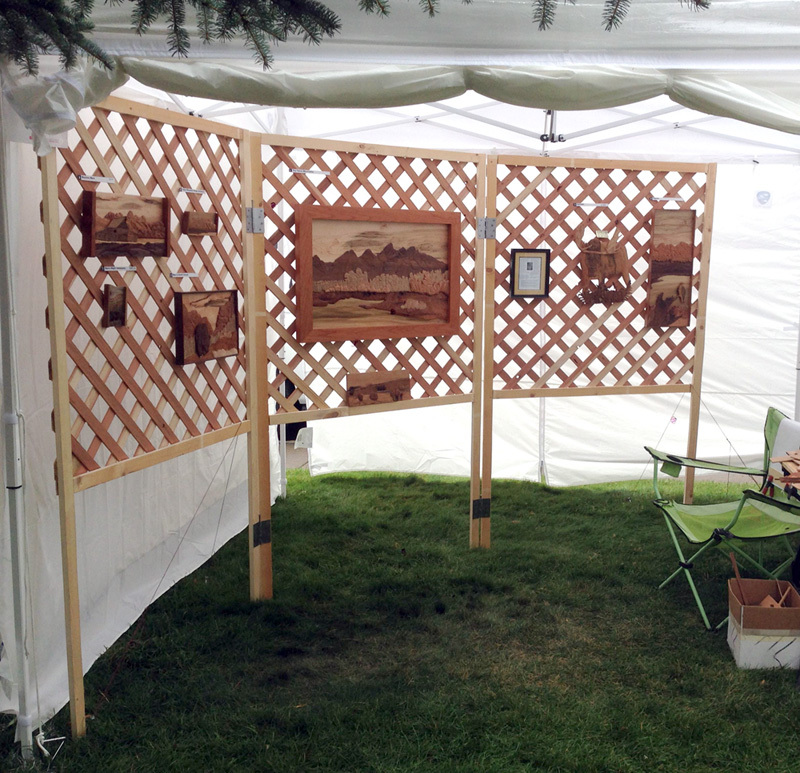 I then went on to jury into the Jackson Hole Art Fair in the summer of 2015. 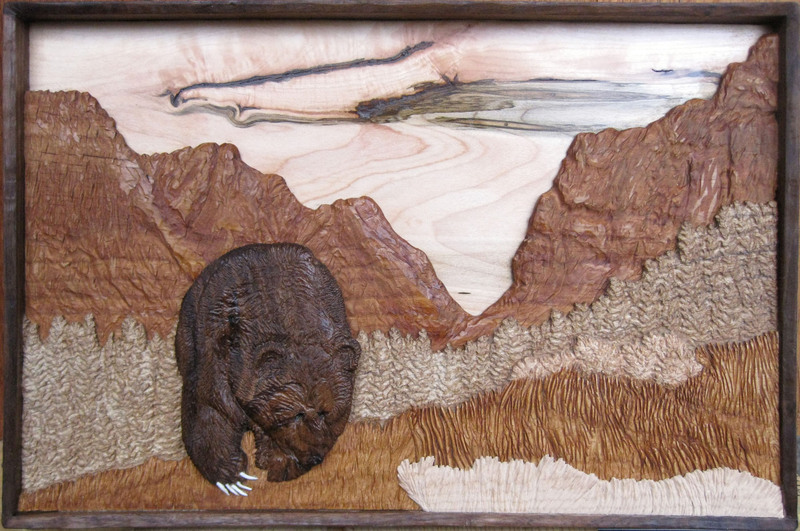 The bear in this sculpture is from a photograph that my wife took in Yellowstone Park. The claws are carved from deer antler. This carving is referenced from a painting by Robert Bateman. The unusual aspect of this carving is that the oak panel used for the face of the moose already contained the image of the face formed in the grain and the accompanying knots. I happened to come upon a matching pose of a moose picture of this ‘face in grain’ in Mr. Bateman’s painting. Quite unusual. 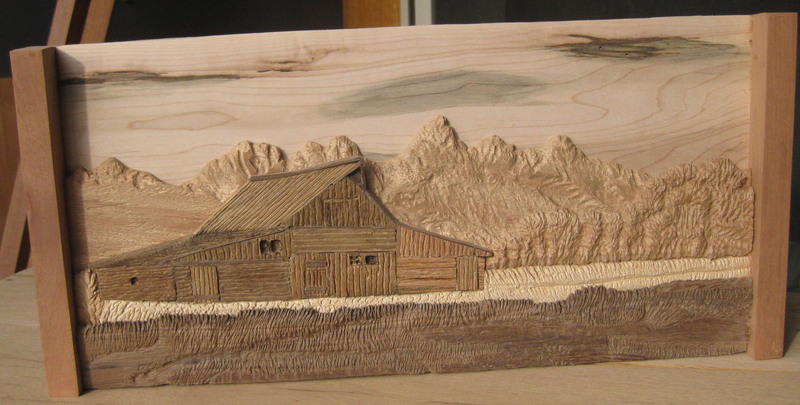 My fourth carving is the famed Moulton Barn out on Mormon Row. This is the most photographed barn in the United States if not in the entire world. 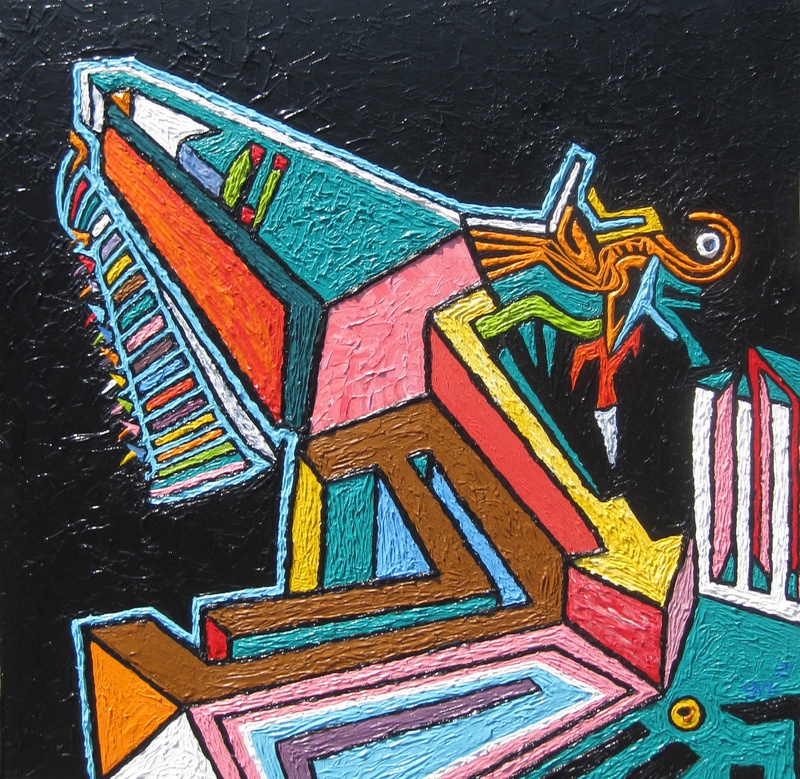 Presently this piece is entered in the 2015 Salon Show of Jackson Hole. UPDATE: This piece took third place in the ‘People’s Choice Awards’ for the Salon Show of Jackson Hole. 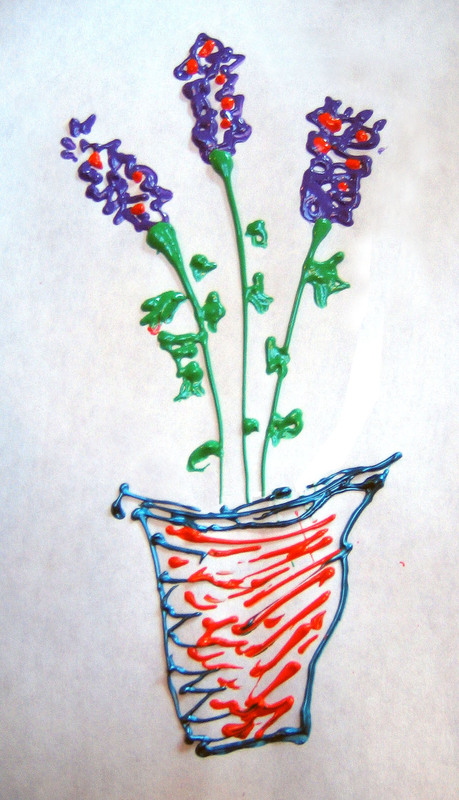 I work in various mediums including charcoal, watercolor, acrylics and pencil. 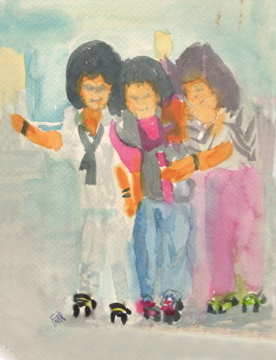 One of my first watercolor attempts from the 80’s. 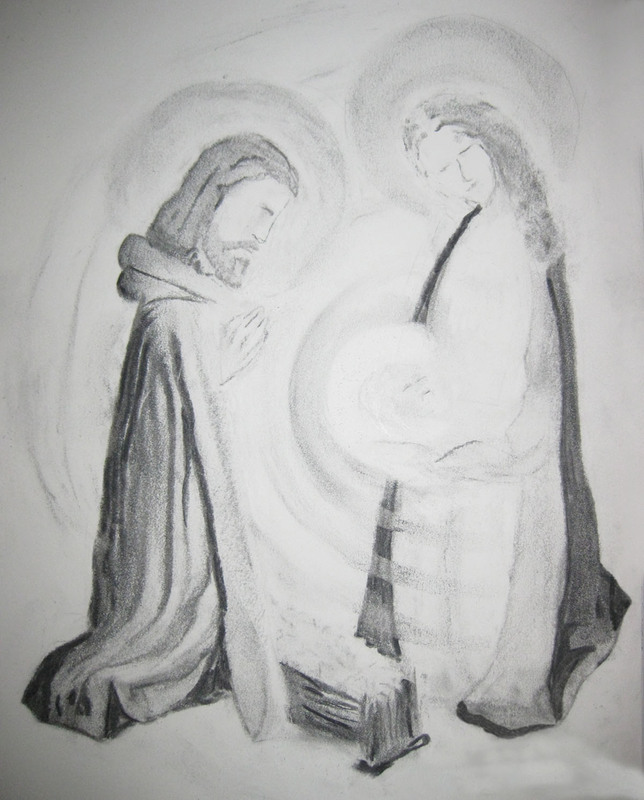 Recent illustrations comprise those of the Joyful Mysteries of the Rosary. 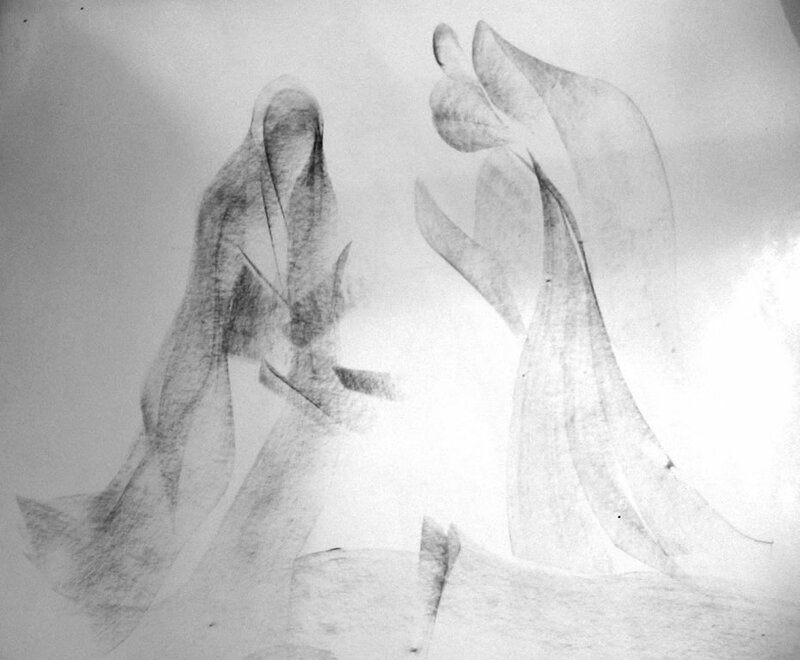 This is the third mystery, Nativity. 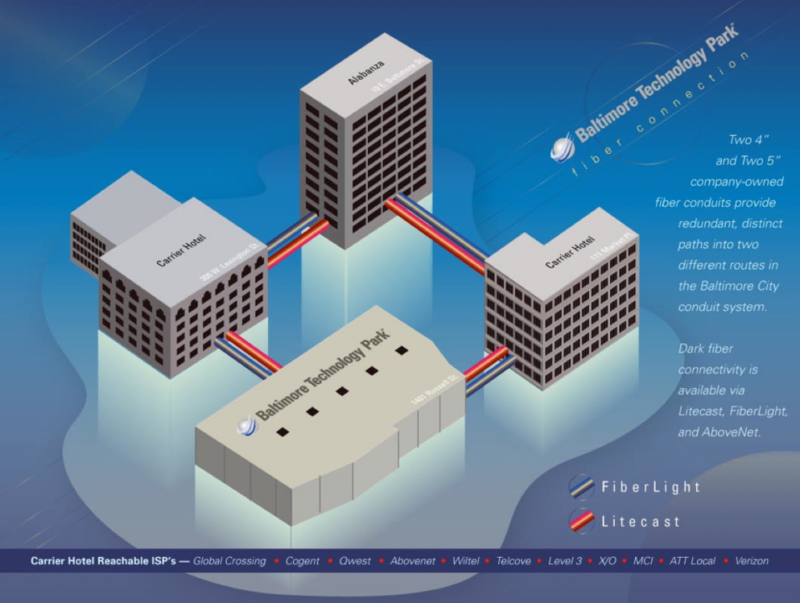 In the early 2000’s employed by Alabanza Corporation I was tasked to create a poster which illustrated the technical aspects of our newest endeavor, Baltimore Technology Park. 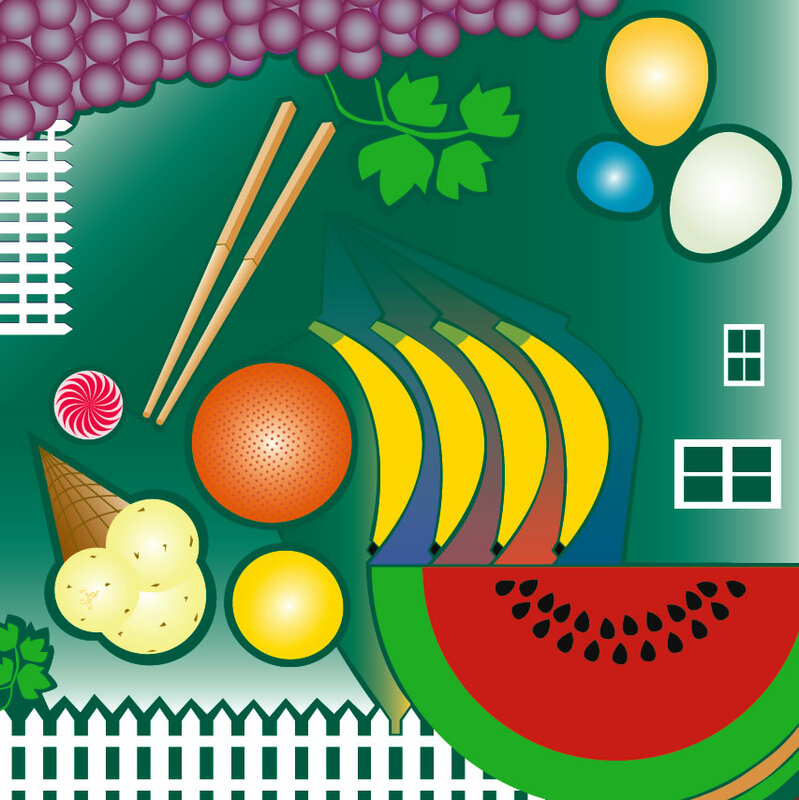 Back in the early 2000’s I began creating fine art vector illustrations. My first showing was at the Howard County Community College Art Gallery. You can read the story about these works at www.floosiga.com.